Stoer is called "An Stòr" in Scottish Gaelic. The village is a crofting township in the parish of Assynt, Sutherland, in the Highlands of Scotland. 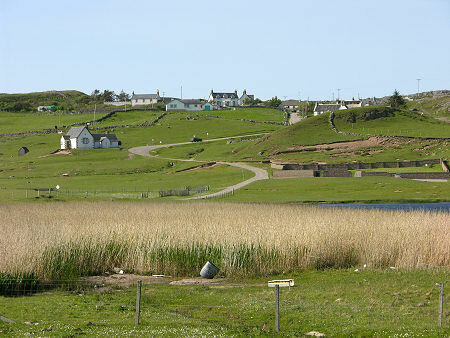 Nearest village is Lochinver, 7 miles to the south. Norman McLeod (1780-1866), a minister, came from Stoer. Stoer is a small village that is just south of the Stoer Peninsula and directly north of Clachtoll, known for Europe’s largest meteorite strike. The single track B869 runs between the scattered houses, the winding road follows the coast from Lochinver to Kylesku Bridge. Two of the most impressive buildings in Stoer are closely related, being the church and manse built to Telford's standard design in 1829. The church is now converted to "The Sanctuary" and the manse is now known as The Green Cruachan, where you can sleep, have a good vegetarian breakfast and can stop for a lunch (high-season only) while driving the beautiful North Coast 500. Stoer Bay is just south of Stoer and offers a broad sandy beach and attracts geologists from all over the world to the area. Once you could find a semi-arid climate where rivers flowed and silted up, where lakes became established and dried out. When overlooking the bay to its south you can see the remains of Clachtoll Broch.